https://greenville-spartanburg.bintheredumpthatusa.com/about	Bin There Dump That Greenville-Spartanburg	https://greenville-spartanburg.bintheredumpthatusa.com/img/franchisees/50.png	1321 White Horse Road, Greenville, SC	Contact us for more details. We are a local Charlotte dumpster rental company who provides residential friendly dumpster rental services. Our roll off dumpsters are grean and clean when you get them and they are perfect for waste removal, junk removal or most trash and garbage removal nees. So whatever your cleanup needs are, Bin There Dump That Charlotte NC will have the right dumpster rental solution for you. Our roll off dumpsters come in a variety of sizes so we can accommodate any size job. We work with homeowners, business owners, contractors or anyone in need of a dumpster. So if you're looking for a dumpster rental service in Charlotte, give us a call and speak with one of our Charlotte NC dumpster rental technicians and let us show you how we can help. We are a local Greenville-Spartanburg and upstate South Carolina dumpster rental company who provides residential friendly dumpster rental services. Our roll off dumpsters are green and clean and are ideal for waste removal, junk removal or most trash and garbage removal needs. So whatever your cleanup needs are, whether you are removing construction debris from a home remodeling/improvement project or doing a decluttering project, Bin There Dump That Greenville-Spartanburg will have the right dumpster rental solution for you. Our roll off dumpsters come in a variety of sizes so we can accommodate any size job. We work with homeowners, business owners, contractors or anyone in need of a dumpster. So if you're looking for a dumpster rental service in Greenville-Spartanburg and surrounding area, give us a call and speak with one of our dumpster consultants and let us show you how we can help. 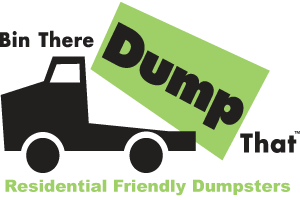 Bin There Dump That is a residential friendly dumpster service to Greenville, Spartanburg and the surrounding areas. We take away almost anything that municipal trash handlers will not. Our unique system allows prompt response to customer's requests. Our bin or dumpster sizes vary from 10 to 20 yards and are placed on your property using a unique roll-off dumpster system. The whole trash or junk removal system is designed so the trucks, bins, dumpsters fit perfectly in the average residential driveway. The footprint of the bin is similar to that of a minivan. Our courteous and professional Dumpster Delivery Experts will arrive in a clean uniform and vehicle to place the dumpster where ever you want. If it is going to be placed on a driveway or walkway, we protect the surface using our unique system. Once the bin is full, simply call us and we will return at the pre-arranged time to remove the bin and clean up in the general area of the dumpster. You will receive friendly, quick, and reliable service. These ideas may not be new, but our service and residential friendly dumpsters gives us the edge when it comes to the mini disposal business. Our bins, dumpsters, and vehicles are unique to Bin There Dump That and are designed with the simplicity and versatility in mind. We are able to get the bins into and out of places that companies can't even consider. Trash in North America is a $35 billion industry. Each year 10% of North Americans move and almost half will perform some type of home improvement. There are growing restrictions on curbside trash pickup and, generally, most of us want to avoid the inconvenience of making a trip to the landfill site. Everyone has trash and it is one renewable product that is not likely to disappear. Here's how we do it - You simply call to order a bin from our courteous local dumpster consultant. He will discuss your needs with you and then schedule a convenient time to drop off the bin. You don't even need to be home! Before we drop the bin we will be sure to place our unique driveway protection boards down on the driveway. The bin never even touches the ground! You or your contractor fills the bin and you call us when it's full. We come and pick the bin up, being sure to sweep up before we leave your house. Are You Ready To Trust Bin There Dump That With Your Dumpster Rental? Whatever project you're doing, from home improvement project to home clear out, we have the right dumpster size for you.